The Wolf of Wall Street is one more movie which impresses me so, me penning down something about it. Like in my previous articles about inspirational movies for Blogging or Digital Marketing, world, here is one more thought to be shared with all my friends. You can check my previous articles on blogging lesson from 3 Idiots on ShoutMeLoud and What Blogger should learn from Once Upon a time in Mumbai. I assume you have already watched the Leonardo DiCaprio starrer Hollywood film, The Wolf of Wall Street because it can not be missed as it was rated 8.3 points on IMDB. As Digital Marketers we need to focus on lot many things, specially when we want to increase sales via Digital Making. 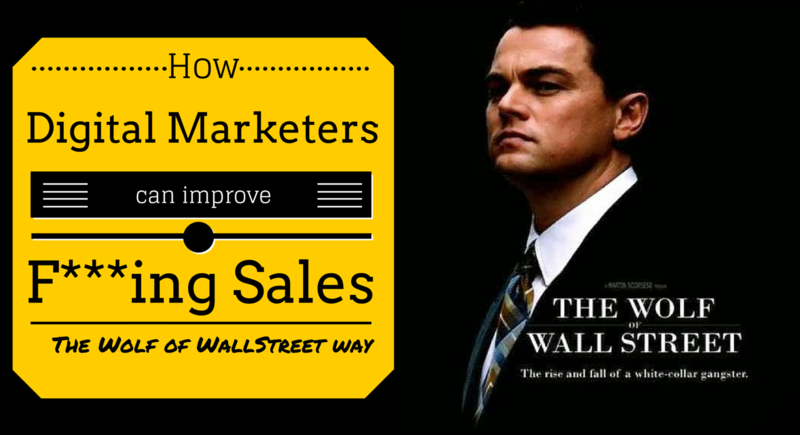 So how this movie can motivate your sales efforts? Most critical part of the movie and for digital marketers, one should learn from Jordan Belfort (Leonardo) we should keep us motivated and keep the things going on. This is critical for any Digital Campaign if you can’t identify urgency for the sale and show that to your potential customers, you might lose them. If you can’t identify urgency then create one, same like you can see in the following video. You can see that when Jordan (Leonardo) was asking Brad (Jon Bernthal) to “Sell Me The Pen”, he simply asked Jordan to write his name and he realized, he is not having the pen. Being a Digital Marketer you must keep eye on opportunity not only for your business but also for your client’s business too. You must have a proper landing page which creates urgency for the user to fill up the page for an Inquiry or generate sales for you. Have graphic rich banner which generates curiosity about Brand/Product and the user will click it more, this is how you will improve your Click Through Rate (CTR) as well as gain more visitors. Irrespective you are Digital Marketer or CEO or any management person, Team motivation is must thing for the organization. In the movie, if you have seen, how Jordan was motivating his team. It was an awesome approach. Entire team felt so motivated that they started shouting (literally) and as a leader, your job is done. Congratulate them every time when your ranking goes higher, your PPC is doing better, your Social Media go viral or your Email conversion ratio will shoot up. During entire movie, if you might have noticed that Jordan had never ever felt he lost the game. He kept on trying and trying, eventually, he won the game. Life is all about problems but you are the one who chooses to how you should take it. For people like Jordan, Dhirubhai Ambani and many other business tycoons “Problems are opportunities”, they have the ability to convert every problem into opportunities. For Digital Marketers, problems like not getting ranking, PPC campaigns are not performing well or Social Media issues but they want to come out of it. For SEOs, you must avoid common SEO mistakes and focus on various Keywords on various pages. We all know that Jordan used to pump and dump stocks and that is kind of illegal activity and he had been to jail for that. He changed his path later on and became a motivational speaker, this is how you should stop doing unethical digital marketing practices if you are doing any. Google’s main object for rolling out Panda and Penguin search engine updates is simply to stop web spamming and unethical SEO practices. The same way Facebook, Twitter and other network keep taking preventing actions for better results. So what’s your suggestion for this post and let me update on whether I have missed anything which I was supposed to cover. And Keep watching good movies. Traffic is very important to increase the ranking and visibility of any site. To make the site visible people mostly take the help of SEO and write content with keywords that are mostly searched. There can be cases when your content is good, has an eye catchy title and also popular well crafted keyword but enough traffic is not coming into it then you need to try various other methods. 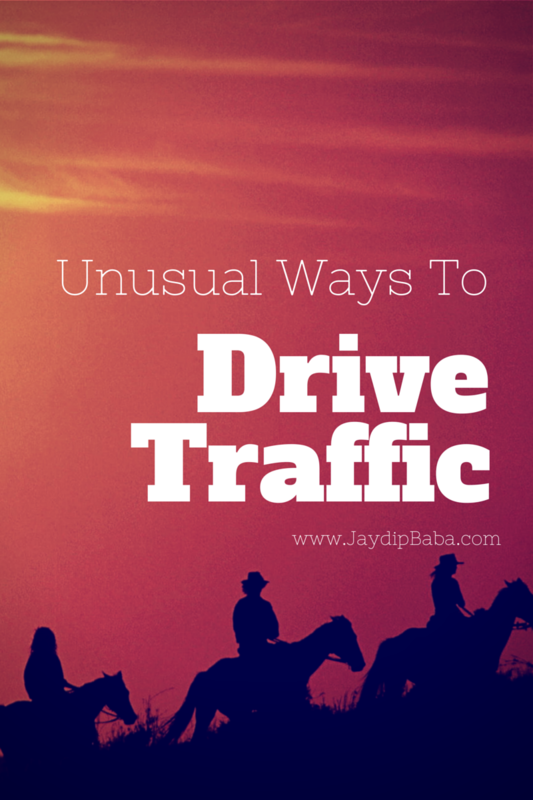 Here are some simple yet unusual methods of pulling traffic. Every company has their own brand ambassador who is renowned and people know him/her by name. If you are writing content for the promotion of your site then along with the companies detail and its product you can write a few sentences about the person, mail him/here requesting to read whatever written. If you have a customer base or employees you can also send them an invitation and request them to read and spread word of the content. This is promoting website through word of mouth. Blog commenting is also another way of driving traffic. You can write comment in blogs that have relevant information and leave link of your content behind requesting the blogger to read yours too. Twitter cross promotion is another hidden weapon to attract more traffic to the site. During the process you can tweet on other’s posts and earn points which can be used for promoting your own content. You can also add followers and for doing this you need to follow them. You can also shout out and post status on your twitter page telling people that you have new content for them. You can add the link of your content below your mail signature. By doing this any email you send, the receiver will see a link below your signature and out of curiosity would like to check what is there for him/her. check WiseStamp which might help you for email Signatures. You can make good use of social media sites to drive traffic. You can be a part of communities, comment and share their posts on regular basis so that when you add your link they also eagerly share it with others. By doing this you can generate massive amount of traffic. There are also many free platforms where you can promote your site or content for free. For example, Instagram has a large number of followers. You can post a small video or picture here letting everybody know about you. You can also post image on Pinterest. Pinterest has a work of pinning and re-pinning posts. You can like or re-pin other’s posts so that they also visit you and share your posts with others. Did we miss anything creative way to drive traffic ? Comment with your thoughts. Will new gTLDs change business dynamics? One of the major challenges a new business entity facing today is either brand name or registering a suitable domain that gives more mileage on internet & search engines. Nine out of ten enterprises will agree to this fact that keeping a domain name that reflects their business philosophy or what they offer will benefit them in the long run. However, there are thousands of enterprises that devise something unique or sometimes irrelevant to their business. Branding and advertising agencies are ones which boast most unique or sometimes weird domains; they do not insist that there should be at least one keyword in the domain name. Instead, their domain names are suggestive of something far fetched. Unlike William Shakespeare, who minimized the value of any name (What’s in a name), when it comes to brand’s website, name is everything. 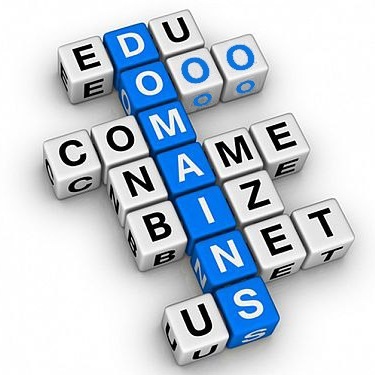 And perhaps therefore, almost every brand goes for generic top-level domain names (GTLDs). Some of the popular domain class are .com (commercial), .net (originally intended for Internet service providers, but now used for many purposes), .org (for non-profit organizations, industry groups, and others), .gov (U.S. government agencies), .mil (for the military), .edu (for educational institutions); and .int (for international treaties or databases and not much used).Internet Corporation for Assigned Names and Numbers (ICANN) is going to expand GTLD scope and therefore, there are many companies and organizations who will be planning to buy new, custom and costly (GTLDs). Sensing this opportunity, big shots active in different spheres are applying for new GTLDs relevant to them. Moreover, these giant organizations encourage smaller businesses to start mulling the advantages of selecting for new TLD. Big companies are actively applying for new gTLDs relevant to them, and they have inspired many smaller businesses to start weighing the benefits of opting for a new TLD. The new ICANN-approved labelling effort increases the approximately 270 top-level websites in use nowadays to a large number of new extensions. Till now, around 2000 applications for gTLDs are awaiting, which range from manufacturers, brand and communities, to big ideas and search phrases. This means that your product could get a domain name that particularly symbolizes your service mark of niche. Significant brands like Google, Amazon and Microsoft company have already sent their requests for gTLDs, which were scheduled to go live at the end of 2013. The benefits of gTLDs for big organizations are apparent. However, SMBs will be able to take benefits of topical GTLDs. For an example, a real estate firm known as ‘Robust Real Estate’ might be fortunate enough to get ‘robust.realestate’ as its web address, under the new program. Unforgettable, no? There is also a new .OOO extension; this is relatively new extension in the market but has potential to gain immense popularity as there are many upcoming enterprises looking for suitable extension. “Open” and “Closed” are two kinds of new gTLDs. Open gTLDs are sellable, enabling merchants to distribute smart website names along with the new extension, as we have mentioned above. Closed ones are for particular companies, like Microsoft company, so that the company can provide its websites from a sector that is specifically theirs. Regardless of whether or not your product is able to get a short name like “donut.ooo,” you will likely have more – and more affordable – choices than the restricted area of available .com titles at this factor. Though, we estimate that you should anticipate to see cybersquatting and a successful additional industry for the new gTLDs, for sure. The new gTLDs will probably modify SEO. For instance, a software retailer who is selling Microsoft products will no longer be able to make any progress in search engines with the help of traditional SEO. Soon, the common online software merchandiser might lose its market share as giants like Microsoft gets brand recognition and respect, which makes them more authentic. This is the opportunity to earn more bucks. The new norms of gTLDs will provide more credibility to brands, manufacturers, making your websites the go-to place of information and interaction with brands. The new ways make it a bit difficult for any business’ area of strength on a particular segment of the market. The new dynamics of gTLDs will encourage online merchandisers to showcase their brands in new ways; maybe this new pattern will not support some old concepts of SEO. It is not clear how the tables will turn but it is always advisable to say that brand relevance will be more significant than ever. Every brand has to select a new TLD that is closely connected with brand philosophy. As the common customer progressively browses the web from a cellular phone, it is exciting to take a position about the impact of the new gTLDs on mobile branding. It sounds sensible that appropriate and/or branded gTLDs will help customers look for the merchandisers they look for for more quickly than ever. Right now, the new gTLDs are costlier, but in the future, they seem to perform right into a better, more consolidated consumer. Perhaps the new gTLDs will become the biggest, most appropriate, and recognisable search tool for branding. How will they work for you?